8/7/2012 C N. Cincinnati, OH -- K9 Waves is a LIFESAVER! I cannot say enough good things about this service. 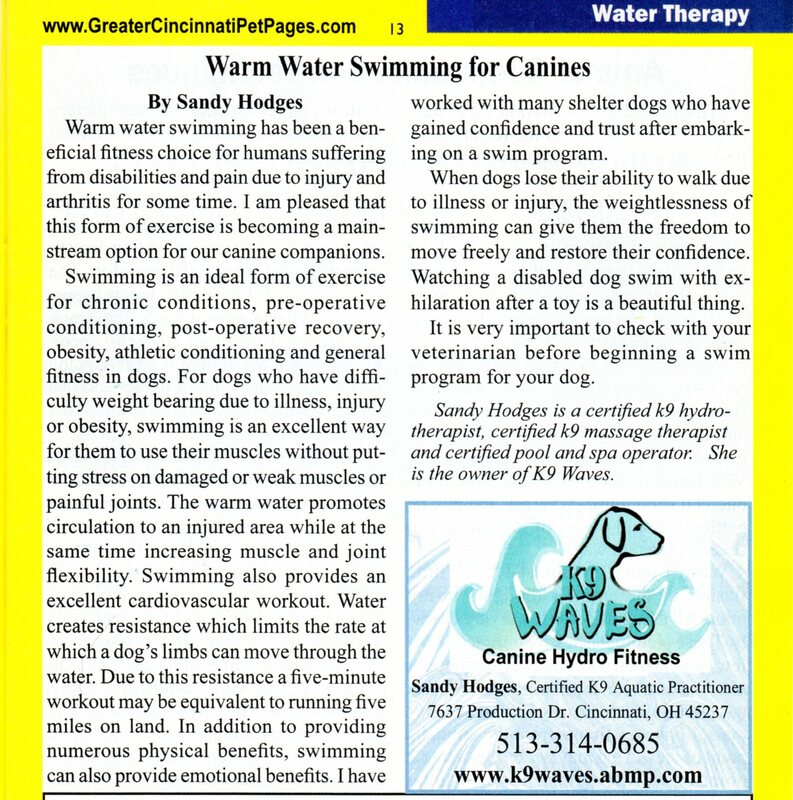 Sandy Hodges at K9 waves provides personalized, warm water swim therapy for dogs of all sizes. I have a venerable 13 year old Giant Schnauzer who has been swimming at K9 waves for one year. I initially took him to K9 Waves to help him with mobility to aid some mild stiffness and arthritis. In this past year, he has also had a toe amputated due to toe cancer, and major surgery to remove a benign growth that was pressing on his spinal cord. Throughout it all, he has continued to swim as soon as medically possible. As a result, he is in better shape than when he started. The changes are just amazing, and he looks forward to his swim. Just say "swim" and he will even leave a juicy pork chop and head for the car...and start barking as soon as we turn the corner. Melanie M. Cincinnati, OH -- K9 Waves is a special place. You can take your dog here for swimming, indoors in a heated pool year round. Sandy is the owner and she is very talented making the dogs comfortable and enjoy their experience. Dogs can swim just for fun, but he real deal is If your dog has had surgery or arthritis or any mobility problems this is hydrotherapy and can make a huge difference in rehabilitating an injured dogs. You will have much more success in the pool than by using an underwater treadmill. The dogs are more comfortable too. This is also a great too for dogs who are fearful or shy, swimming really gives them that needed boost of confidence. I can't recommend this more for anyone with a dog. I take my 12 year old mix who has arthritis and she hates water/swimming and still enjoys herself.